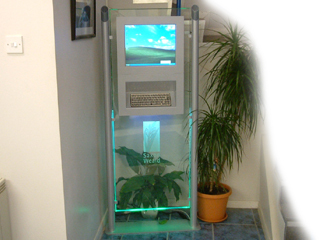 i-Touch V33s Slim-Line Glass Floor standing kiosk with 15'' screen - Future Generation Kiosk Products. V33 is a stylish, minimalist glass model. Designed to be non intrusive this unit, pictured on the left, has the class and style to fit into both classic and modern styled locations, fitting in beautifully with the surrounding decor. Dimensions: 600(15 inch)/650(17 inch)x1600x120 (WxHxD). Weight: 45kg / 47kg(17 inch).